10 Days left to claim. Unclaimed PEOS will get BURNED. On the 15th of February, we took a snapshot for pEOS, an eosio based project aiming to bring private and untraceable transactions on eos, shortly after on the 25th of February we started airdropping PEOS tokens 1:1 to EOS according to our snapshot. If you missed the pEOS announcement check out our site, you can also join us in telegram or follow us on twitter and medium for more information. If you can see a PEOS token balance in your eosio account, It is important to claim them. There are two ways to claim your PEOS tokens. You can send any amount of PEOS tokens to another eos account and automatically claim PEOS for both accounts. Action: Account A sends 0.0001 PEOS to Account B. Even though we initially planned for the unclaimed PEOS to be spent towards marketing, we are already adequately funded and we decided to remove them from circulation. 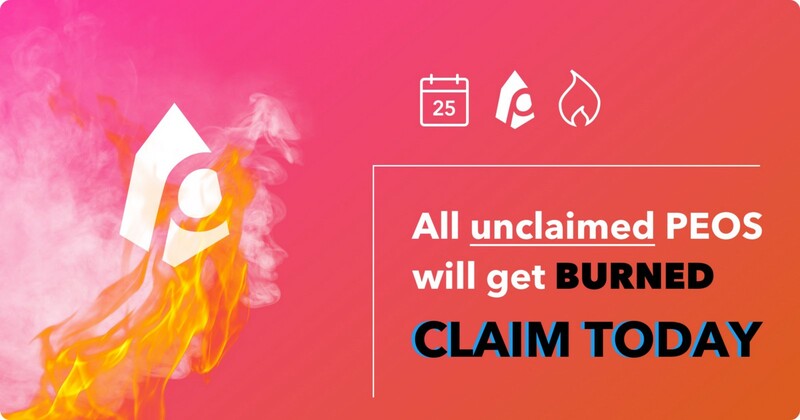 After the 25th of April unclaimed PEOS tokens will get burned, effectively reducing the total supply. Information about amount of unclaimed tokens etc will be released after the claim deadline. We really want to get as many people as we can to claim their PEOS tokens. Helping us put the word out there and raise awareness about the project, will help eos holders to not miss out on this opportunity and to create stronger pEOS community. Also don’t forget to request from your exchange the claim and distribution of PEOS tokens to its users.